The outstanding NA-550 supports the latest Intel Xeon processor E3 series with Intel C206 chipset as well as supports four high bandwidth DDR3 1333 MHz non-buffer non-ECC/ECC DIMM sockets up to 16GB memory. For greater flexible and easy maintenance, the communication appliance has three front-accessible expansion slots that allow developers to configure PCIe LAN modules based on their solution requirements. Powered by the new-generation Intel Xeon processor E3 series with flexible expansions, the rackmount network appliance is ideal for IDS/IPS, VPN, content filtering, UTM, network security applications, and cloud computing solutions. It supports 3rd/2nd Generation Intel Core i7/ i5/ i3 processors with Intel C206/C216 chipset and four DDR3 333 memory up to 16 GB. 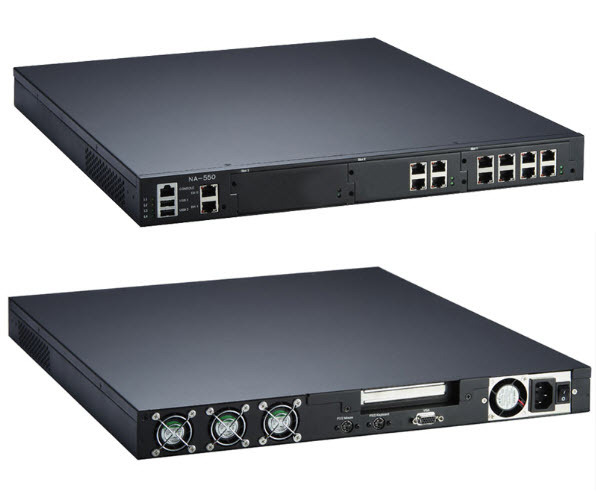 For greater flexibility and easier maintenance, the NA-550 has three front-accessible expansion slots that allow developers to configure different LAN modules based on their solution requirements. The NA-550 has storage interfaces featuring one 2.5" SATA HDD and one CFast. To solve shutdown issue, the NA-550 supports up to six groups of LAN bypass function through software program.